In the lead-up to the ceasefire, our correspondent said the battles were "incredibly heavy" Saturday overnight. At least 10 houses in Gaza were reportedly struck by Israeli aircraft overnight, she said, including in the town of Khan Younis, where at least 20 people died. The announcement of the truce came just hours after Israel's cabinet rejected the terms of a US-sponsored longer-lasting ceasefire that was meant to end the fighting. Speaking in Egypt, Kerry confirmed the rejection but said diplomats were still trying to work out a deal. Kerry met Ban Ki-moon, UN secretary-general, in Cairo on Friday, and spoke by telephone to his Qatari and Turkish counterparts. He will fly to Paris on Saturday for another conference on Gaza. Israel has already indicated it plans to step up its incursion into the Palestinian territory. 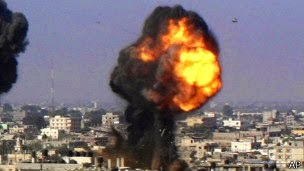 Gaza's Health Ministry has said that 870 Palestinians have been killed since Israel's assault on Gaza began on July 8. More than 5,740 have been injured. The growing casualties in Gaza have caused anger in the West Bank, prompting two days of mass protests in several cities and ensuing clashes with the Israeli police that killed at least nine Palestinians. Al Jazeera's Imtiaz Tyab, reporting from the West Bank, said Israeli forces used live rounds and tear gas to disperse protesters. "In Hebron, 16 people were been injured after Israeli forces opened live fire on protesters. In Jenin, 14 people were hurt, most suffering gunshot wounds," he said. "In Bethlehem, five were injured, one reportedly critically after being shot in the chest."